Calvary Women’s Services is blessed with a capable and generous board of directors, whose guiding vision has shaped Calvary’s continued growth over the years. Our Board has provided excellent leadership over our significant expansion over the past 30 years, including fundraising, volunteer and financial support, and connection to pro bono services. 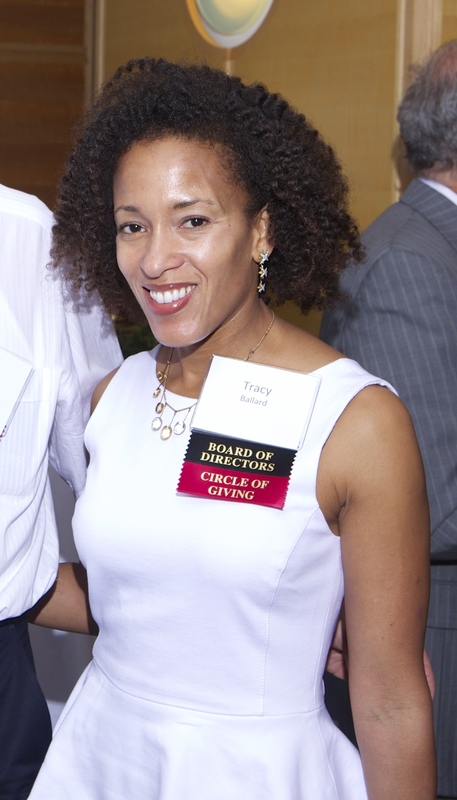 Today’s profile puts the spotlight on Tracy Ballard, who led the organization through two years of tremendous growth as President of Calvary’s Board of Directors. I moved to the Washington area as a young attorney almost 20 years ago. The city has a uniqueness that has always appealed to me, and stands apart from others in the sheer concentration of organizations and agencies operating in the public interest. As my career took me from the private to the government sector, both domestically and abroad, I felt a gravitational pull toward public interest work. Two decades and two children later I devote the majority of my time to parenting and to nonprofit volunteer work. What motivated you to join the Calvary Board of Directors? Years ago I attended a Calvary fundraising event sponsored by a friend who was a board member at the time. I was transfixed by the success story shared at the event by a Calvary program graduate, a woman who had been able to lift herself out of the abyss of hopelessness armed with nothing but the sheer force of her own determination and needed support from Calvary in bringing about a profound life change. With Calvary’s help, she had embarked on a remarkable and successful journey to a productive life, one filled with hope. I resolved then to get more involved. What stands out about Calvary to you? I was, and continue to be, awestruck by the commitment and dedication of Calvary’s management and staff, dedication that is exceeded only by the need for the services they provide. They work tirelessly to provide the programmatic support necessary to empower personal change in a community that historically has been underserved. Calvary is able to address the needs of its clients in a more complete way than any other organization due to the sheer breadth and depth of its service offerings, and staff works continually to expand the range and enhance the richness of its programs. As a board member and as board president I also have had a birds-eye view into how efficiently the organization is run, and have been consistently impressed with how effectively funds are managed and resources deployed. Nothing is wasted at Calvary. How has your position as board president allowed you to focus on the work and values that are important to you? My tenure as board president has been a privilege in that it entrusts me with the responsibility of guiding the execution of the board’s collective vision for Calvary Women’s Services. Together with Calvary’s management and staff we have sought to expand Calvary’s service footprint and bring our high-caliber program offerings to as many clients as we can. Our purchase last year of a permanent home on Good Hope Road in Anacostia was the realization of a dream held by many affiliated with Calvary, and I will feel ever-fortunate to have participated in this effort. What does your vision for Calvary’s future look like? My vision for Calvary includes establishing more permanent housing for our clients, continued focus on nutrition and healthy eating as supported by our Good Hope Kitchen, following our strategic blueprint for enhanced service and program options, and of course, planting a Good Hope Garden in our new backyard! Tracy’s passion to help the women we serve and her vision for Calvary’s future have both shaped her tenure as Calvary’s Board President for the better. Big thanks to Tracy for her hard work and dedication!